Indonesia is a country that has incredible unspoiled nature and long history. It might take a lifetime to explore this gorgeous country. However we have picked ten staggering places you should consider visiting once in Indonesia. Check out the list and pick your favorite. The park covers a huge area and features rich nature, including two volcanoes – Mount Gede and Mount Pangrango – found in the heart of the park. It is also home for various endangered animal species. Hiking, birdwatching and animal watching trips are therefore favorite among the tourists. Locals fish at the Situ Gunung Lake, which looks so enigmatic. It is possible to go camping in the park and spend a night in a tent, while continuing your trip the next day. Climbers usually choose Mount Gede: spectacular views to the park and the crater open from the summit. There are various trails that lead to the both volcanoes. Another impressive attraction is hot streams around Cibeureum waterfall. Found in the Valley of the Kings, the resort is owned by an Australian family and offers an ultimate relaxation. 25 luxurious villas with private pools are built in a tropical forest, which protects guests’ privacy and also provides great sites. The resort is a perfect romantic retreat for the couples and newlyweds. The guests can use special spa treatments, that combine Western and Balinese techniques. At the most respected restaurant on the island chef prepares a French menu supplemented by Asian ingredients. Viceroy Bar provides a wide variety of finest drinks. The resort also organizes weddings of all sorts – from a traditional and private to a sumptuous ceremony. Ijen is a 20 kilometers wide caldera, which houses more volcanoes in it. One of them is the Kawah Ijen volcano, which is filled with sulfur. When it burns the blue flames appear – the site is especially amazing at night. Although the surroundings look rather unfriendly – an acid lake and petrified sulfur in the caldera – they are useful. The tourists are offered various tours, that will take them to the Arabica plantations, to the volcanoes, where they get to see the boiling sulfur, which occasionally starts to burn, and unspoiled nature. Alila Purnama is a unique luxurious hotel on a ship. The spacious interiors have all the facilities and amenities necessary for a romantic cruise. Alila chain has established many hotels and this one is definitely the most exciting one. Komodo Island Expedition is a 6-night trip to the land of Komodo dragons. The ship sails along the scenic coastline. Ambon Exhibition takes visitors to the region of Banda Islands, famous for the rich marine life and coral reef. Raja Ampat Expedition takes the adventurers to the divine places, with crystal clear water and diving opportunities. The unforgettable experience is guaranteed. Found in Ubud, which is also a worldwide famous holiday destination known for its impeccable resorts, Tegallalang rice terrace is an ancient wonder. The elegantly descending terraces and high palm trees attract tourists to the valley. A viewpoint provides a spot to admire the site and take pictures. Even some painters come here to capture the beauty of Tegallalang. The land owner offers tourists a coconut drink, to pose for a photo and to buy a hat made of fronds. There are other terraces in the neighboring villages of Pejeng and Campuhan as well. On the Tulamben’s rocky beach the famous Liberty shipwreck attracts divers. Also corals, sponges, turtles and various fish species can be explored in the clear waters. There are many diving sites and the beginners can hire experienced instructors. Diving training courses and diving safaris are available. An eco-luxury boutique hotel offers a truly unique and unforgettable experience. The creators of the resort combined traditional with modern achieving stunning results. Guests are accommodated in the antique Javanese teak wood villas, built 100 years ago and now restored to fully match the world-class quality. The resort is surrounded with lush gardens, that help reconnect with nature. The staff organizes various activities and tours, including visits to the temples and Balinese ceremonies, hiking trips and tours around the local villages, and even hosts weddings – from small ceremonies to exquisite gala events. 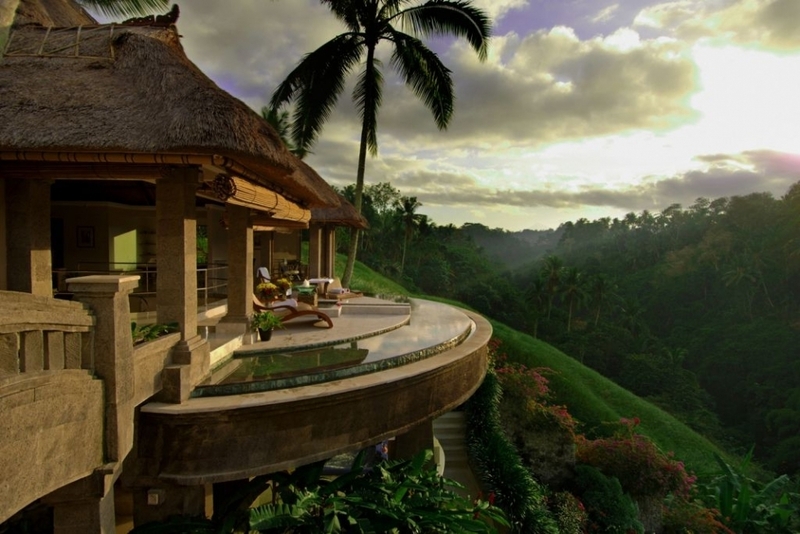 Bambu Indah is for individuals, who are seeking a memorable and original retreat. The Mahayana Buddhist Temple was built in the 9th century and can righteously be called an icon of Indonesia. One of the most recognizable sanctuaries in the world is also the most visited tourist attraction in the country and is protected by UNESCO. The temple is a complex of six square platforms, decorated with reliefs and 504 Buddha statues. From above the whole complex looks like a tantric Buddhist mandala. Today the temple is still used for praying and meditation. 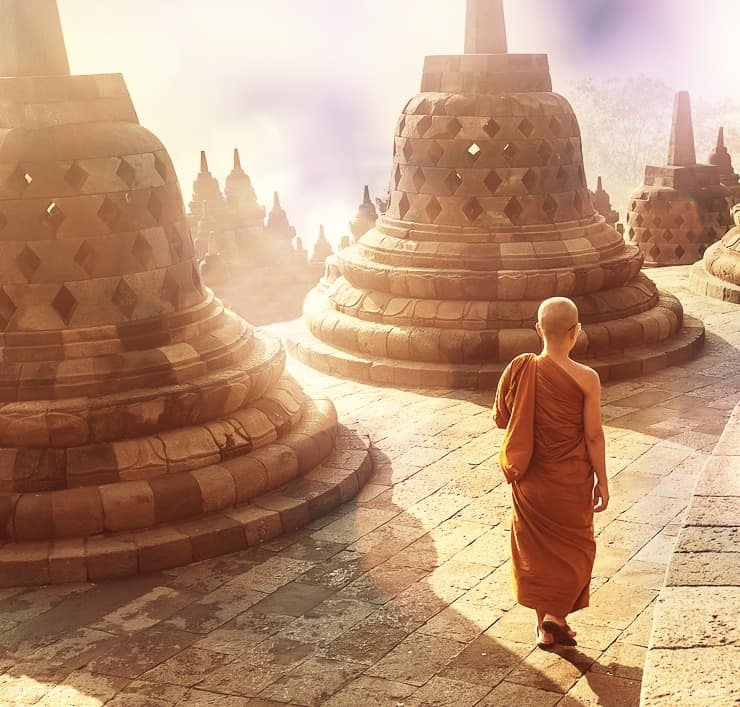 Every year during the full moon pilgrims gather here in May or June to celebrate Siddhārtha Gautama’s conversion to Buddha. A volcano has three amazing summit crater lakes of different colors. The water of the lakes is red, green or blue. However, it changes due to the fumes, coming from the volcano and causing chemical reactions. It is believed by the locals that the lakes are a resting place for their ancestors. According to their tradition, the water color corresponds to the moods of the spirits. One can never predict the colors of the lake, as sometimes they change to white and black. Definitely a unique place on Earth, also the national park, where the volcano is situated, is worth visiting. The volcano is located in Bromo Tengger Semeru National Park, which is a popular tourist destination. Lately Mount Bromo was active in 2004, 2010 and 2011. Therefore, during the Hindu festival locals travel up the mountain to sacrifice food and flowers by throwing it into the volcano’s caldera. The volcano is embedded in the breathtaking surroundings and provides an overwhelming experience.